The imminent explosion of cross-border e-commerce websites will cause a stir in the global e-commerce logistics market, predicts TMR in a new study. The market will also receive a boost from the availability of low-cost cargo. Already, the spread of B2C and C2C e-commerce websites has resulted in an increase in the demand for both domestic and international e-commerce logistics. Sellers are now expecting a greater degree of transparency and efficiency in their chosen e-commerce logistics providers. This will also pave the way for higher customization in e-commerce logistics services. At the same time, companies providing these services are trying for look for practical ways to reduce costs – especially those associated with reverse logistics. Among the key services that e-commerce logistics companies provide are warehousing and transportation along with some other types of niche services. The global e-commerce logistics market is expected to surpass US$781 bn in 2024, up from its valuation of US$122.2 bn in 2014. The estimated CAGR of the market between 2016 and 2024 is 20.6%. TMR finds that in 2015, the transportation segment was larger than the warehousing segment of the global e-commerce logistics market by service type. This is explained by the fact that transportation is important all through the e-commerce logistics process and will gain even more importance as all large and small companies target last-mile delivery. The transportation segment has been split further into air/express delivery, trucking/over road, freight/rail, and maritime. Of these, the trucking and over road segment accounts for the larger share because it is the most prevalent transportation method. The preference for trucking and over road transportation is further elevated with the logistical difficulties and costs associated with rail and air transport. The sheer population growth in the Asia Pacific region has created multi-billion dollar opportunities for companies in the e-commerce logistics market. About 60% of the world’s population resides in Asia Pacific, the World Population Review 2015 has revealed. Add to this the stupendous rise in sales of smartphones and in internet connectivity and it is easy to see why companies are looking a massive opportunity in the face. Although several countries in Asia Pacific are still in the development phase, their burgeoning middle-income families represent a ripe target market for e-commerce companies. Moreover, e-commerce companies in Asia Pacific are expected to widen their reach in line with road and infrastructure development projects. Thanks to these dynamics at play, the Asia Pacific e-commerce logistics market will log a CAGR of 22.4% between 2016 and 2024. However, in terms of revenue, North America will not budge from its dominant position through the forecasting horizon, TMR expects. The excellent digital infrastructure in the region and the healthy B2C sales will continue to create a conducive climate for the growth of the e-commerce logistics market in North America, which stood at US$48.32 bn in 2015. However, with the U.K.’s exit from the European Union, the e-commerce logistics market in Europe could run into a rough patch. The regulations are poised to become more complex and compliance will pose a challenge. The top companies in the e-commerce logistics market are FedEx Corporation and DHL International GmbH with over 50% of the market. Other notable players are Gati Limited, Clipper Logistics Plc., Aramex International, XPO Logistics, Inc., Kenco Group, Inc., United Parcel Service, Inc., and others. E-commerce has transcended its fundamental nature to become an integral area of business today while spanning across a plethora of industries. The e-commerce industry has gained global recognition because of the spurring demand for e-commerce in a multitude of B2B and C2C exchanges. It has torn regional boundaries to connect various business entities from different geographical pockets, and hence, the global market for e-commerce logistics is expected to escalate over the coming years. Moreover, the growth of e-commerce is not just beneficial for players within the industry but will also thrust the development of external companies. The global e-commerce logistics market is broadly categorized into two groups which provide a spectrum to analyze its distinctive characteristics. The first group of segments is based on the type of service provided by e-commerce logistics channels and the second rests on operational area. The report encapsulates a comprehensive set of insights on the global e-commerce logistics market based on meticulous research and analysis. The trajectory of the growth of the market over the coming years is carefully knit to provide the most succinct forecast to the reader. E-commerce is gradually becoming a platform for various companies to tangibly launch their businesses and reap the benefits of global reach. A massive number of startups have been launched in countries such as India, Brazil, and Mexico, which is driving the global market for e-commerce logistics. Moreover, the increased focus on connectivity and an estimated influx of drone delivery systems could further uplift the market. The e-commerce logistics market is severely hampered by unethical buying practices resorted by consumers. A number of buyers often purchase additional products to gain the advantage of free delivery or other perks, and later return the products quoting unmatched standards. There are other discrepancies of arrangements within e-commerce distribution channels which pose a threat to the market. Infrastructural penury is amongst other factors that are hindering the affluent growth of the market. The inhibitions in the market could be outnumbered by the magnitude of opportunities that have bloomed in the global business for e-commerce logistics. The growing population in Asia Pacific providing multibillion-dollar growth prospects is a significant plus on the e-commerce landscape. Besides this, the sellers are now seeing a trend of increased faith in their distribution channels exhibited by consumers. Several companies are now taking measures to bring down operational costs, which is an optimistic sign for the market. 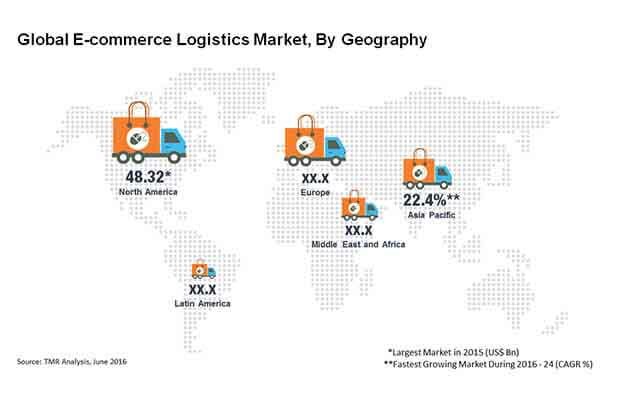 The geographical segmentation of the global market for e-commerce logistics covers North America, Europe, Asia Pacific, the Middle East and Africa, and Latin America. The impressive digital infrastructure of North America has been accentuating the growth of the region over the past. This is expected to in turn help the region to maintain its lead in the future. Asia Pacific, owing to a renewed zeal toward new ventures, is forecast to experience a higher growth relative to other regions. The global market for e-commerce logistics is speculated to flourish across the Asian continent due to increased growth in India and China. However, a dominant market share is expected to be achieved by North America. The technological revolution is spreading to all corners of the world, which has put the spotlight on e-commerce logistics. Despite the riveting growth rate of the global e-commerce logistics market, there are apprehensions with regard to infrastructural disparities amongst nations that could obstruct market propulsion. Nevertheless, regions with healthy B2C sales are envisaged to create an environment that is propitious for the rise in the demand for e-commerce logistics. Two giant players, viz. FedEx Corporation and DHL International GmbH jointly bagged a 50.0% of the total global business for e-commerce logistics in 2015 and are expected to continue their supremacy in the market over the coming years. Following these are XPO Logistics and United Parcel Service Inc. with an established reach in the market. Top players are envisioned to bid on drones and increased connectivity to outdo competitors while smaller players could focus on value-added services.